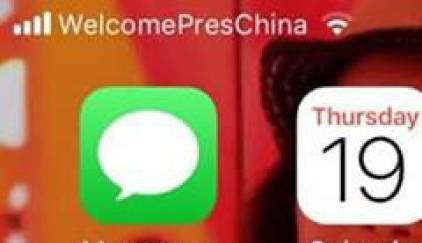 On early Thursday morning, mobile phone users across the country started seeing their provider's names replaced with "Welcome PresChina." Chinese President Xi Jinping is scheduled to land in the UAE today for a three-day state visit, the first in nearly three decades, or since the public official was re-elected to office. President Xi is due to attend a series of high-level meetings, during which a number of bilateral agreements are expected to be signed. The Chinese ambassador to the UAE, Ni Jian, had said on Friday that the Chinese official’s visit is a milestone and is a reflection of the strong relationship between the two countries. “At present, the China-UAE relationship is at its best. It is an exemplary model of mutual respect, friendship and win-win cooperation,” Ni Jian said. The UAE is home to 200,000 Chinese expatriates and 4,000 trading companies. The bilateral trade between China and the UAE was estimated to be around $60 billion in 2015, up from $47.6 billion a year earlier. The Dubai International Financial Centre (DIFC) had earlier noted a growing presence of Chinese firms in the emirate’s financial sector. It cited in a 2016 report that the Chinese banks in DIFC had doubled their balance sheet over an 18-month period.